Simply put…Yes. While we make doors that are a combination of different styles ( louvers over panels, mirrored over bead board, operable louvers over fixed louvers and more ) you can also use different types of doors in the same opening. 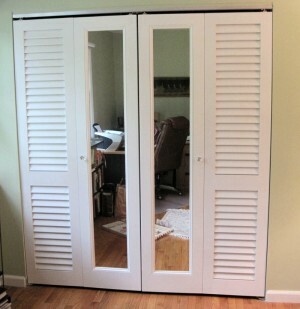 The most common reason to consider combining doors with different styles is if you are using mirrored closet doors. Sometimes an entire wall made up of mirrors can be a bit overwhelming. The doors to the left show how a single, central door was made with a mirror while the outer doors are a more formal raised panel design. Below is another example. 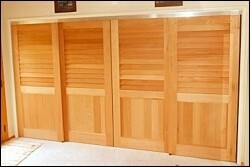 Louvered doors were needed for ventilation in the closet. The homeowners, however, wanted mirrored doors to help with getting ready in the morning. 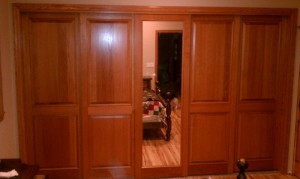 By using both styles of closet doors they were able to get exactly what they needed and wanted. Any style of closet door can be mixed with another. Really the best thing to do is stand in front of your closet and think about how it will be used. For example, will it be used for housing equipment that might need ventilation or maybe sound proofing. Next, think about how you want the closet doors to look. Louvers for a more relaxed or beachy/Caribbean feel. Tongue & Groove or Beadboard to make things look taller. Flat panels for a Mission style home. Whatever look you are going for you can then mix the different styles of closet doors to get that look and the use that you need. If you are not sure what styles will work, you can always give us a call, send us an email or start an online chat. We are happy to help. With fixed louvered doors the louver blades are fixed at an angle and spaced far enough apart so that there is a gap. This is so they provide privacy while still allowing airflow. With Faux lovered doors the louver blades are shaped like a chevron and stacked. 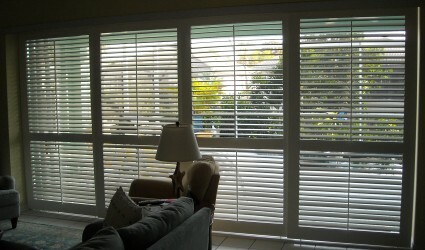 This gives you the look of fixed louvered doors while blocking sound and airflow as well as sight. Since faux louvered doors give excellent privacy some of the applications are for guest room doors, bathroom doors and maintenance doors. Keep in mind, however, that since faux louvers block all air flow they should not be used where ventilation is required such as around air handling, refrigeration and media equipment. 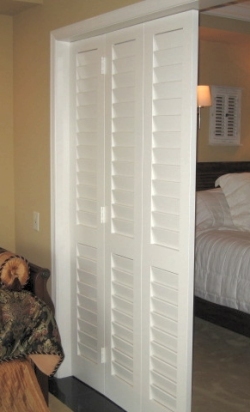 As with all of our other designs of shutters and doors, our faux louvered doors are available in any custom size. We offer faux louvers in 3 different sizes; 1.7/8″, 2.1/2″ and 3.1/2″. All of which can be installed as hinged, bifold, sliding or pocket doors. If you are not sure if faux louvered doors will work for you please ask. Give us a call, send us an email or start an online chat. We are happy to help. We often receive emails and phone calls asking us which doors can be used as closet doors and which can be used for interior doors between rooms. Many people are concerned that there may be some reason why the same door should not be used in both places. The truth is that all Kestrel designs of closet doors and interior doors are interchangeable. This means that you can have your interior doors match your closet doors throughout your home. Something to keep in mind, however, is that some designs may be more practical for certain types of rooms or closets. Operable and Fixed Louvered Doors for ventilation. False Louver, Tongue & Groove and Panel Doors for sound insulation. Glass and Mirrored doors to help brighten dark rooms. 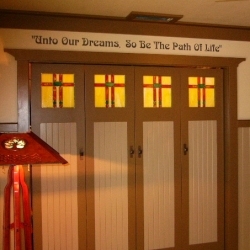 There are also doors that combine designs to offer a bit of each. The stiles of a door (not “style”) are the vertical frame parts of the door. On interior doors between rooms it is not uncommon to see wider and thicker stiles. This is because most locks and door knobs require a hole drilled right through the door. The thicker door and wider stiles allow this while keeping the door itself structurally sound. 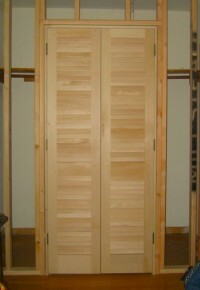 On closet doors the overall thickness and stiles can be narrower since locks and handles are not usually required. There are 4 basic types of hardware for doors. Hinged doors, pocket doors, bifold doors and sliding doors. 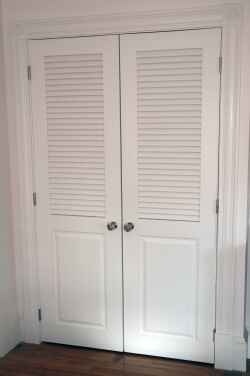 With closet doors all 4 types of hardware are used consistently depending really only on how you plan to use the closet. While with interior doors we normally see hinges it is still common to use bifold, sliding and even pocket door hardware used. Below are two good examples. Traditional bifold door hardware is used to separate two rooms within a church. 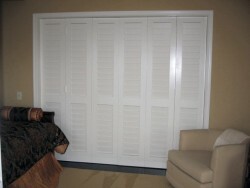 Operable Louvered Doors use sliding door hardware to close off a lanai. If you are not sure which door designs and options will work best for you please ask us. Give us a call, send us an email or start an online chat. We are happy to help.